Introducing Mookaite, a quartz mineral from Western Australia, which actually owes its existence to billions of long-gone life forms. This is a fascinating mineral, attributed with grounding and promoting open-mindedness and intuitiveness. This lovely, warm, opaque stone is characterized by random patches and bands of vibrant colour, varying between white, grey, mustard, yellow, orange, red, purple and brown. Though it is often referred to as a jasper, it isn’t one. It tends to show the characteristics of either chalcedony, opalite or chert, depending on the degree to which it has been silicified, but what places mookaite in its own unique category is that it is, in fact, a silicified concentration of billions of tiny little fossils. Mookaite’s intriguing origins are explained by a geological formation known as Windalia Radiolarite, a vast siltstone outcrop in Western Australia formed 105 to 115 million years ago at a time when the Carnarvon region was submerged under shallow seas. A sediment build-up of billions of microscopic organisms called radiolarians, unique because their skeletons consist of opaline silica, remained behind on dry land when sea levels eventually retreated. Either through the silica content of the radiolarians or the surrounding weathered rocks, some of the sediment silicified (became impregnated with or transformed into silica) to form what we know as mookaite. The presence of mineral impurities in the mix, such as manganese and iron in different concentrations, has stained the otherwise grey and white sediment in various shades of colour. The hardness of mookaite varies with the degree to which it has been silicified, though it generally rates between 6 and 7 on the Moh’s Scale. 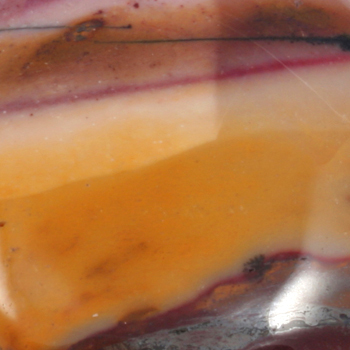 A beautiful variant of mookaite is Brecciated Mookaite. Brecciation refers to a geological process where earth movements cause mineral deposits to break and shatter. Then, over time, as water rich in silica flows between the broken pieces, the silica crystalizes and fuses the pieces together again. The end result resembles a mosaic of mookaite stones in varying hues. Mookaite is a grounding and stabilizing stone whose specialty is broadening horizons. It creates an attitude of open-mindedness and flexibility and inspires one to strive for new experiences whilst maintaining a sense of calm. This combination of qualities helps one to be innovative and decisive. Mookaite opens and clears the base, solar plexus and third eye chakras. It helps bring our attention to the present. As a spiritual aid, it promotes active meditation through every living moment. By increasing our awareness of and assisting us to harness the Earth’s electromagnetic energies, it helps us to enhance our personal power. In times of emotional stress mookaite is said to be fortifying and protective. The open-mindedness that characterizes mookaite’s influence on us extends to a sense of intuition of our selves and of those connected to us. Helping to understand children is such a quality attributed to mookaite. It helps one to intuit and understand the issues that may be affecting a child, thus allowing parents or other carers to better communicate and deal with a child’s welfare and behaviour. This attribute apparently extends to unborn children as well, allowing parents to better prepare for the arrival of a new baby. Similarly, it is claimed to facilitate communication with animals. This intuition reaches beyond our own generation as well. Mookaite helps us to tap into our genetic memory, to understand and break free of emotional and behavioural patterns inherited from our ancestors and thus to clear ancestral karma for ourselves and for generations to come. Physically, mookaite is attributed with healing wounds and strengthening the immune system, and is said to be beneficial for the body’s nervous system, glands, stomach, liver and spleen, and may help in treating water retention and hernias. By creating an acute awareness of one’s beliefs about ageing and providing the space to change those beliefs, mookaite is even said to actually slow the physical ageing process.